Professional review of Venu Anti Cellulite Massage Oil. See how it compares against other cellulite creams. 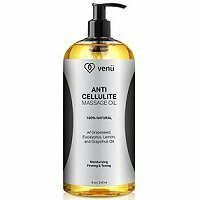 Venu Anti Cellulite Massage Oil gets 1 out of 5 stars from me. The whole thing is just an unfortunate mess without any plus side to it. The oil gets everywhere, is greasy, and refuses to absorb in. It literally takes over an hour for it to even semi-dry. So you walk around with heavy, thick oil just sitting on your skin. The oil also likes to attract every little thing possible like fuzzies, cat hair you name it. And to make matters worse, I saw zero improvement. It literally didn’t help my skin or appearance of cellulite whatsoever. There’s no moneyback guarantee and the website directs you to Amazon. And the pricing is a little sketchy. Right now it’s only available for $49.99, which is just 1000% ridiculous and please don’t pay that much for it. I do like the smell of the oil but that’s literally about it. The whole thing is a mess and I hate it. 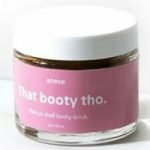 Save your money and the headache and avoid this anti cellulite massage oil. It’s a yellow tinted, liquid oil that’s very slick and runny. I loathe this application process. It’s messy and annoying and just makes zero sense. Apply the massage oil on damp skin after taking a shower or bath as this will lock in moisture. Oil applied to dry skin will coat the skin but will not penetrate. Massage oil in circular motion until oil is absorbed. I did exactly what the directions said and it was still a nightmare every time. I applied the oil right after showering and purposely left my skin damp. I even re-wet my skin to ensure that it wasn’t dry. No matter what method I took, the oil just refused to absorb in. It just sat there like a thick oil coat. I would massage it in and it just never seemed to cooperate. And the pump is hard to use because it shoots out the liquid-y oil super fast and it gets everywhere. The drying time takes absolutely forever with this oil. You have to wait over an hour or longer for it to fully dry. AND you’re sticky the whole time and it just feels heavy and gross. Not to mention, literally everything sticks to you because the oil acts like a debris magnet. In the bottle, this oil smells good. The smell is probably the only thing I like about it. It has a refreshing grapefruit, lemon scent that’s pleasant. It smells natural and reminds me of essential oils. The smell fades away a little while after applying. And the smell is completely gone a few hours after you’ve applied the oil. The short term results were nonexistent. I literally saw no improvement. It didn’t even make my skin softer, suppler, or more hydrated. Which is usually the least a cellulite cream can do. Unfortunately, even after using this massage oil for a longer period of time, I still saw no results whatsoever. My skin tone, appearance of cellulite, etc. was all 100% the same as before. Such a waste of money! There are only 4 ingredients used: Grapeseed Oil, Eucalyptus Oil, Lemon Oil and Grapefruit Oil. They have pretty ridiculous claims on the website about what these ingredients do. But here’s what the potential benefits are believed to be according to some online research. Grapeseed Oil has astringent qualities that are thought to tighten and contract the skin. It’s hydrating and regenerative, two qualities that may help reduce the appearance of cellulite. Eucalyptus Oil has anti-inflammatory properties that may help soothe irritated skin and also gives a cooling, refreshing tingling sensation that may possibly tension and stress. Lemon Oil is believed to help improve the circulatory system, increase microcirculation, strengthen vascular tissue, and diminish the appearance of varicose veins. Grapefruit Oil is another potential cellulite buster because it’s suggested to stimulate metabolism and help break down fat and cellulite. It has antioxidant and anti-inflammatory properties that help nourish and protect the skin. So the Venu Beauty site directs you to Amazon to buy their product. I originally bought it for $19.99. It’s an 8-ounce bottle, so that works out to $2.49 per ounce. When I went back to grab the link for the review, the product was sold out or unavailable apparently. It currently says you can buy the product from other sellers for $49.99. I don’t know if that’s the new price or what. But please, please don’t buy the product for that much! Or even at all! It’s really not a good value at any price. There’s no guarantee to be found on the Venu Beauty website. Also, the site automatically takes you to Amazon to buy the product. I always think that’s weird. You might see if Amazon offers some type of guarantee for you. To buy Venu Anti Cellulite Massage Oil, click here. Application So messy and annoying!